Alan and I visited a new hot spot this weekend called the Humble Lion Café. This tiny café opened not long ago on Sherbrooke, in the convenient and central location right across from McGill’s Roddick Gates. The minute I walked in, I noticed the huge number of students trying to escape the winter weather with a warm cup of coffee! The music was a little hipster and set the mood for a great study spot. The baristas were friendly and knowledgeable about their coffee without being overly snobby. We chose the biscotti and Mediterranean biscuit for breakfast. 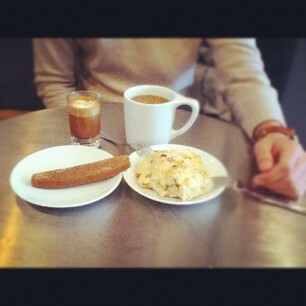 They were both delicious and paired nicely with Alan’s coffee and my Macchiato. I loved the vintage vibe in the café that was nicely set by the lighting, bar and stool. The neatest part was probably the counter that is actually a recycling lane from a bowling alley. Even though this is a new café, their coffee was amazing and I’ll be sure to visit them again between classes!